Bovis Homes representatives were proud to attend a special ceremony marking a major step forward in a scheme delivering a wide range of community facilities to part of Oxfordshire. They joined local dignitaries from Cherwell District Council to celebrate the start of construction work on a community centre for the benefit of new and existing residents at Longford Park, just two miles from Banbury town centre. The new building, which will open to the community this summer, will include a large hall, office space and meeting rooms, and a dedicated youth wing featuring a hall and a coffee bar, along with gardens and play areas. 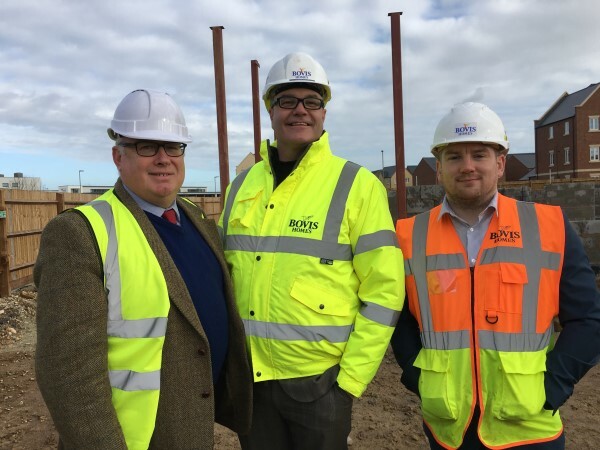 Bovis Homes Area Sales Director Colin Dean said: “We're delighted that construction work is now underway to deliver this modern and attractive building that promises to become a real hub of the local community. Additional public amenities planned for Longford Park, which has been devised by a consortium of house builders including Bovis Homes, include a wildflower meadow, ponds, footpaths and sports pitches and a pavilion.